The mid-range smartphone market is currently saturated with great value handsets. This is good news, but it can also cause a little “options paralysis.” With so many great phones to pick from, how do you choose? The choice between the Nokia 7 Plus vs Honor 10 is the perfect example. 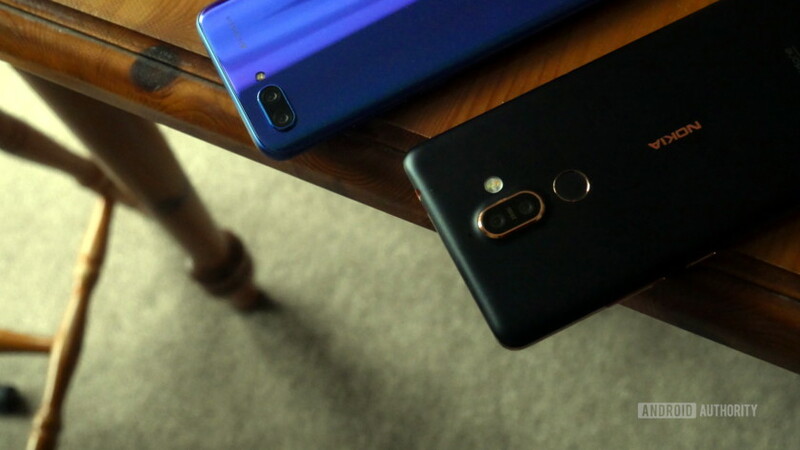 Nokia 7 Plus vs Honor 10 — two impressive contenders for the title of best value mid-range Android device. Both the Nokia 7 Plus and the Honor 10 provide some very impressive features and specs for their 350 pound (~$470) and 400 pound (~$535) price tags respectively. But they’re also rather different propositions. Let’s take a look at each and hopefully help you decide which one is right for you. I’ll just lay it all out. The Honor 10 is more powerful and has a more interesting camera, whereas the Nokia 7 Plus has a better design and software experience. The Honor 10 turns heads with its shiny “aurora glass” back panel. It catches the light in a sometimes beautiful manner but it’s not going to be to everyone’s tastes, and it also feels a little plasticky and light. It’s a glass build but the type of glass is unspecified. On the whole, the Honor 10 looks nice and doesn’t feel cheap – it just doesn’t feel flagship either. The Nokia 7 Plus on the other hand really comes into its own in this regard. It feels cool and weighty in the hand thanks to its aluminum build. It has classy copper accent around the sides and it’s coated in layers of ceramic on the back, giving it a smooth, matte finish. During my time with it, I found myself occasionally stroking the back absent-mindedly. That’s a sign of a nicely made phone! I said the Nokia 7 Plus wouldn’t turn heads in my review, but I didn’t mean that as a bad thing necessarily. The Honor 10 design might be louder, but the 7 Plus looks and feels classy, understated and sophisticated. On closer inspection, while these are similar in terms of resolution (Nokia: 1,080 x 2,160, Honor: 1,080 x 2,280) and both are IPC LCD displays, the Nokia 7 Plus has the slightly more pleasing panel when you lay them side-by-side. Its blacks look just a little blacker, and it’s also bigger at 6 inches vs. 5.8 4inches. The Honor 10 is narrower, with a 19:9 aspect ratio achieved by some very trim bezels and the inclusion of a notch, which for some commenters I’m sure will be an instant deal breaker. Both have great screen-to-body ratios in general. The Nokia 7 Plus might have the edge in terms of design, but the Honor 10 comes with the more impressive hardware inside. Both devices sport 4GB of RAM (in the U.K.), but the Honor 10’s Kirin 970 chipset is a step up in theory from the Snapdragon 660 found in the Nokia. In practice, the difference actually isn’t that noticeable, and you’re unlikely to find the 660 wanting in many real-world scenarios. I have two personal benchmarks I like to try out with mid-range phones. Both were up to a bit of Google Cardboard, but neither could quite handle GameCube emulation. Interestingly, the Nokia 7 Plus was smoother in the former test and actually came closer to a playable framerate in the latter scenario. This is likely due to differences between the Adreno 512 GPU versus the Mali-G72. In Antutu, the Honor 10’s GPU performance significantly outpaced the Nokia’s. At the end of the day, there’s not a whole lot of difference in real-world usage, despite the Kirin 970s flagship status. In fact, the Nokia performs better in some CPU benchmarks, which is a little surprising. The Kirin 970 includes onboard AI with its neural processing unit (NPU). This brings rapid face unlocking to the table, theoretically smarter memory management, and some cool camera tricks (more on that in a moment). I much prefer the placement and performance of the fingerprint sensor on the Nokia, despite the new-fangled ultrasonic technology in the Honor 10, but the face detection on the Honor 10 is fantastic and more than makes up for it. Helping the Nokia’s performance along too is the arguably superior software experience. While the Honor 10 has the EMUI 8.1 UI layer on top of Android 8.1, the Nokia 7 Plus proudly brandishes its Android One status, offering a near-stock experience and will be first in line for updates. Some people like EMUI, but many – myself included – find it aesthetically unappealing, bloatware heavy, and a little sluggish in places. The Nokia 7 Plus isn’t a perfect software experience, though. I noticed one or two strange glitches in the software that I reported in my full review. Several of those have already been fixed, and I expect more will be soon. Though I have also now found some new bugs. The biggest thing the Honor has going for it is the camera, but both phones are impressive. Both are dual lens setups. The Nokia 7 Plus has a 2x optical zoom lens for its secondary shooter. The Honor 10 comes with a black and white sensor for increasing dynamic range. The Honor 10 has a higher megapixel count. The primary lens is 16MP backed up by 24MP, which beats out the 12MP and 13MP on the Nokia 7 Plus – though neither setup is anything to sniff at. Both have f/1.8 apertures. Around the front, we have a 24MP camera on the Honor 10 and 16MP on the Nokia. Again, these are solid numbers in both instances, but the Honor 10 takes first prize. But numbers only tell so much. The real reason I prefer the Honor 10’s camera has more to do with its numerous nifty features and great app. Not only is there the now-compulsory portrait mode and increasingly-common pro mode (both of which are also in the Nokia 7 Plus), but there’s also suite of other cool things to play around with. My favourite is the light painting and star tracking feature. Then there are AI features like scene recognition, which Honor is keen to rave about. These can be a little hit-and-miss, but it’s certainly nice to have the option. Moreover, the Honor 10 just seems to take better pictures. The Nokia 7 Plus boasts the same imaging sensor as the Pixel 2, but somehow it still manages to slightly underperform. It’s not terrible by any stretch, it’s just not as good as it could be – with issues regarding exposure and photos occasionally being a little blurry or washed out. Several readers suggested that I try installing the Pixel camera app to see improved image performance but after trying this I didn’t notice a huge benefit, only some new instances of the camera app crashing. Moreover, the Honor 10 just seems to take better pictures. Likewise, the Honor 10 camera isn’t perfect. I found a lot of photos had a slightly warm tint and the focusing could definitely be better. They both fall into the category of not-the-best-but-pretty-good. It’s just that, on the whole, the Honor 10’s camera is more fun to play around with, and capable of superior images, more of the time. While I felt happy recommending the OnePlus 6 over the Honor 10 in that similar showdown, this contest is a little harder to call. You’ll find that many of the pros and cons of either device ultimately come down to opinion. Some people will prefer the Honor 10’s appearance. Some people might not mind EMUI. Maybe you think the Nokia’s photos look perfectly decent. I’ll wind up by saying these are both very good options. For most people the Nokia 7 Plus will make slightly more sense, given its slightly cheaper price. If the camera is your priority, then you may be better off with the Honor 10 instead. There you have it for our Nokia 7 Plus vs Honor 10 comparison. Which one would you pick?